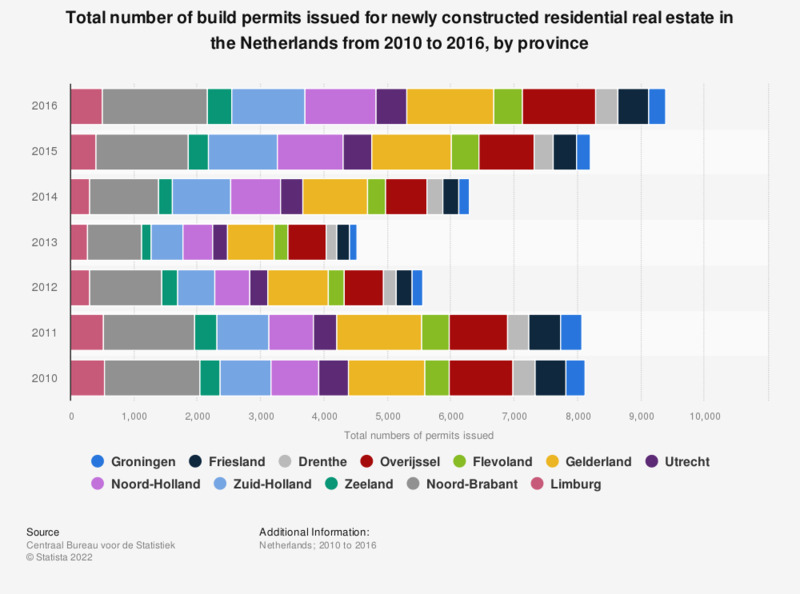 This statistic shows the total number of build permits issued for newly constructed residential real estate in the Netherlands from 2010 to 2016, by province. In 2016, the number of permits issued for the construction of new residential real estate in the province of Groningen was 266. The source states the figures provided, show building permits for newly constructed real estate. The number of permits issued, does not represent the number of real estate constructed, as one permit can be issued for multiple residential or commercial buildings. Moreover, the source notes, residential property includes combinations of residential real estate with a commerical purpose, if the majority of the building value is intended for living purposes. This includes permits for homes, residential units as well as recreational homes.